For correction and wellness, awakening and ascension support. 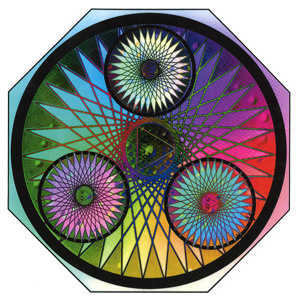 The Geometric design holds and emits energy frequencies of Sacred Geometry creation, which have shown to correct most toxic substances in food, drink, inhalants and skin products, as evaluated by energy assessing and clinical outcomes. The Crystal, Flower essences, Mineral essences, Vitamin, Enzyme frequencies that support all of Humanity have been recorded in the “Recorder-Broadcasting Geometric” design to benefit Humanities shift into HIGHER Consciousness at this time. Moving the energy of correction through, collects and broadcasts the “God” particles, the first particles of physical Creation. Corrects “confusion energy”, organizes everything from power lines, toxic chemicals & metals. This device was created with additions over several years with SPIRIT guidance. Brings in the clarity from the “I am” presence. USAGE: Place keys, cell phones, eyeglasses, sunglasses, gemstone jewelry, any and all electronic devices, including laptop computers on the CAAP to permanently correct all energy going through ALL items as they assist us on our journey of creating Heaven on Earth, rather than limit us on our Journey. Place four CAAP on your refrigerator to energize and correct ALL food and drinks. Placing CAAP on top of your head in Meditation, assists Spirit connection for guidance daily, as it provides the Highest frequencies available to become ONE with Spirit to support our Ascension Path. Place on areas of pain, or challenge within the body to correct and give support to the healing. Click play bar below to listen to a deeper explanation of the correction plate, presented by Dr. Jesse Plagenhoef.